Quick and simple post for a quick and simple recipe. I know what you must be thinking—this post comes a few weeks too late. But truly, this little gem of a bread is so yummy and unbelievably easy to put together, it’s really worth getting beyond any ‘only-for-St. Patrick’s Day’ unspoken rules…you know, from the same unspoken list where you file “no Christmas mugs after January”, right? But seriously, unless you have a beloved traditional must-make Irish soda bread loaf recipe that bars competition, you should at the very least consider filing this one away for next March. It’s easier to punch together than playdough…and just as fun. Plus, you can eat it. The first time Chef F and I baked it we used white whole wheat flour; the second, a lovely Ryze gluten-free blend my sister Laura had given me as a present. Both turned out lovely. This hearty yet light vegan loaf is now a staple thanks not just to how flavorful and satisfying it is, but also for how beautifully it pairs with salads. 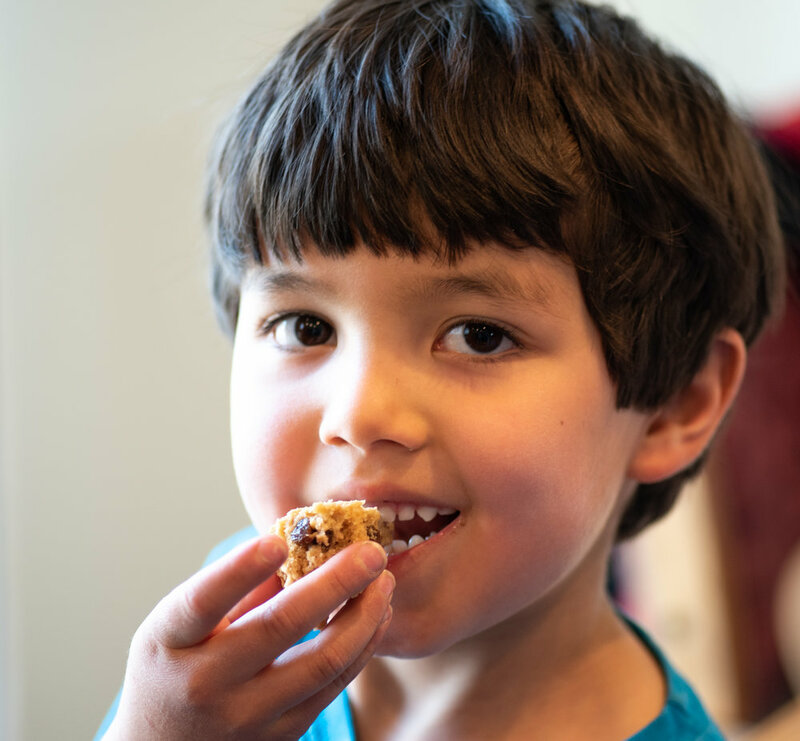 As he grows, Chef F seems to be increasingly establishing himself as the purest vegan eater in the house, with tendencies to raw foodism at that. Crunchy colorful salads as our default dinner? Soup fan though I am, I don’t dare complain. In a small bowl, combine almond milk and vinegar; let stand for approximately 5 minutes or more. In a medium mixing bowl, combine flour, baking soda, and sea salt. Add milk mixture, coconut oil, applesauce, and aquafaba and mix into a sticky dough. Add raisins and a light dusting of additional flour as needed to lightly knead in the bowl to form a round. Place on a prepared baking sheet covered with silpat or parchment paper. Cut an X across the top, and bake 45 minutes, until crusty on the outside and a toothpick placed in the center comes out clean.